Marvel’s First Family burst onto the scene just as the comic book movie genre was finding its legs, but before Marvel Studios laid down the foundation for their eventual massive footprint on the annual release schedule (with the studio aiming for three movies a year through 2020 and potentially beyond). Of course, several different Hollywood studios own the rights to key superhero titles, preventing Marvel and Disney from truly bringing all of their characters together for classic comic book events. But that’s not stopping those individual studios from riding the coattails of the Marvel bandwagon. Case in point, 20th Century Fox, which maintains the rights to the Fantastic Four (as well as the X-Men franchise) is planning to reboot the First Family, releasing a brand new line-up of actors and a different origin story for the team. So, Happen’s Kids Critics are taking a hard look back at the Tim Story adaptation from 2005, which stayed fairly true to the comic book template with inventor Reed Richards (Ioan Gruffudd), his biologist partner Sue Storm (Jessica Alba), her fiery daredevil brother Johnny (Chris Evans), and Reed’s best friend and protector Ben Grimm (Michael Chiklis) blasting off into space – on a shuttle funded, in a bit of a departure from the mythology, by Reed’s rival Victor von Doom (Julian McMahon) – only to be bombarded by cosmic radiation that transforms them into a loving (and slightly dysfunctional) super-powered family. Does the lighter touch on display here work for our young critics? Let’s find out! Based on a comic by Duncan Rouleau and Steven T. Seagle, this animated feature presents the story of the bond between Hiro Hamada (voiced by Ryan Potter), an inventive computer and technology prodigy who started out in life as a sickly kid and Baymax (voiced by Scott Adsit), the cutting-edge inflatable robot caretaker developed by Hiro’s older brother to keep the young boy safe in the futuristic world of San Fransokyo (a city that combines elements of San Francisco and Tokyo). 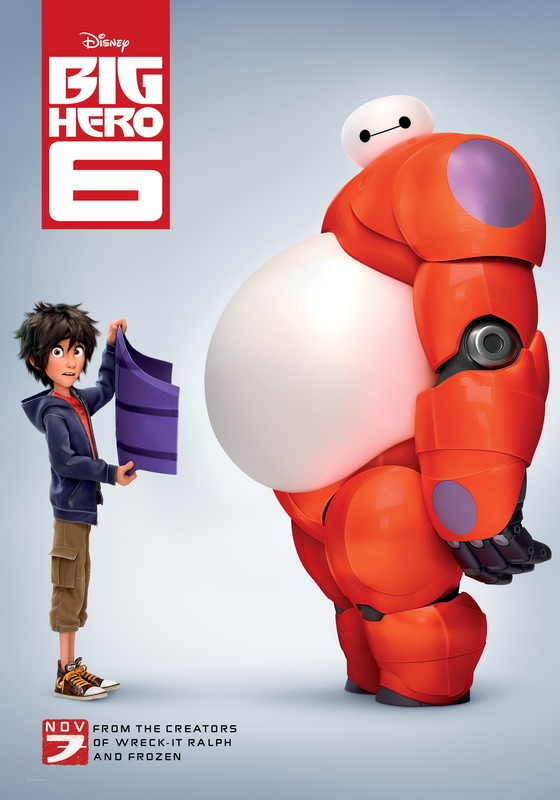 Rather than relying on the typical superhero models of mutants or science experiments gone awry to produce super-powered beings (big unrealistic dreams that kids latch onto), Big Hero 6 focuses on Hiro’s ability to create and manipulate technology in amazing ways, which should appeal to kids today who are growing up in an age where advances in social media and computers are setting new standards for what the future might hold for society. So, instead of big show-stopping songs and sentimental moments (as might be expected from the team behind Frozen and Wreck-It Ralph), Big Hero 6 is about a smart kid and his cohort of equally bright friends who use their intelligence to not only save the world, but potentially have an even bigger impact on it. Now that’s big thinking. “This movie is a good superhero movie. If you like Marvel, chances are you will like this movie. Some scenes were a little over the top, but overall it was entertaining and fun. This month Henry Jost, Happen’s Kid Film Critic, attended the screening of BIg Hero 6 now showing in theaters. Read Henry’s film review below and go see Big Hero 6. “This movie was an awesome movie for the entire family. I really liked the characters and was on the edge of my seat for the whole movie. It is like a Marvel Movie for younger kids. I thought the main character, the boy Hiro Hamada, was a great role model. I also like his hugging inflatable robot, Baymax. The movie was filled with narrow escapes and heartwarming scenes.